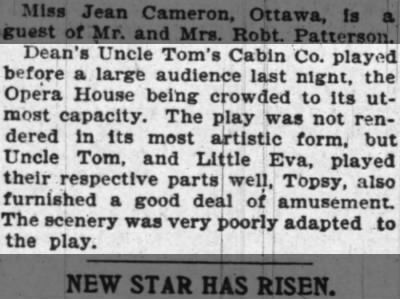 In the 1880’s one of the many Uncle Tom’s Cabin theatre troupe toured through Carleton Place on a regular basis even thought there were constant bad reviews. The first place it played was Newman’s Hall. Here is a tidbit about Newman’s Hall: after the Carleton Place High School moved from Hurd’s Hall; it found it way to Newman’s Hall. There it became the temporary quarters for a High and a Public School class. Newman’s Hall is the building now occupied by the Brewers’ Retail Store on Townline. New Public Hall opened by Mr. Robert McDiarmid. One of the best in this part of the country. Auditorium rearranged to accommodate 500 people. 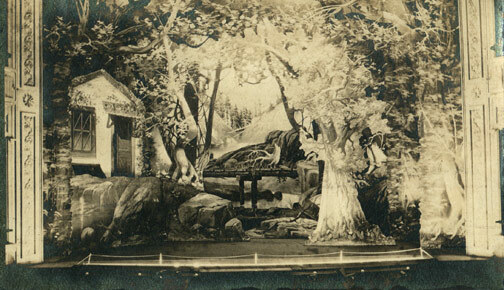 The stage scenery, painted by Sosman & Landis, Chicago, provides four scenes, the ‘woods’, ‘parlor’, ‘kitchen’, and ‘street’. The drop curtain presents a view of placid waters, rugged mountain rocks and ancient castle. 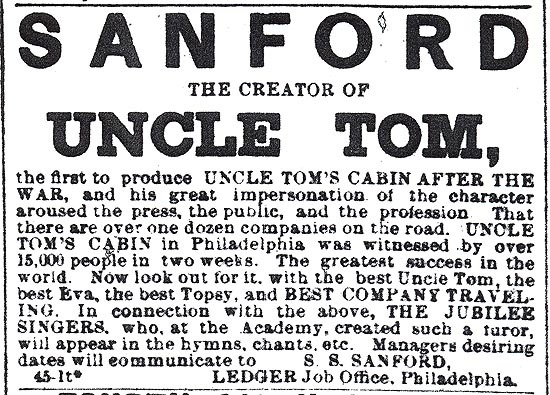 Under the personal direction of John F. Stowe, nephew of the celebrated authoress Harriet Beecher Stowe, Uncle Tom’s Cabin will appear in the Town Hall, Carleton Place, September 19, 1896. Company of 40. 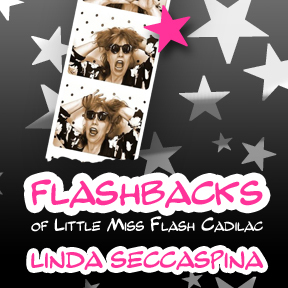 Novel features include the blowing up of the battleship ‘Maine’. 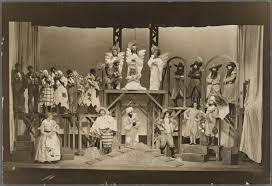 All Tom shows appear to have incorporated elements of melodrama and blackface minstrelsy.These plays varied tremendously in their politics—some faithfully reflected Stowe’s sentimentalized antislavery politics, while others were more moderate, or even pro-slavery.Many of the productions featured demeaning racial caricatures of Black people, while a number of productions also featured songs by Stephen Foster (including “My Old Kentucky Home”, “Old Folks at Home”, and “Massa’s in the Cold Ground”).The best-known Tom Shows were those of George Aiken and H.J. Conway.The many stage variants of Uncle Tom’s Cabin “dominated northern popular culture… for several years” during the 19th century, and the plays were still being performed in the early 20th century.